Sligo Rovers have announced the signing of Bermuda captain Dante Leverock from Estonian outfit Narva Trans, subject to international clearance. The center-half, who spent a lot of his childhood in England, had an impressive season in the Estonian league, including scoring eight goals from the back. 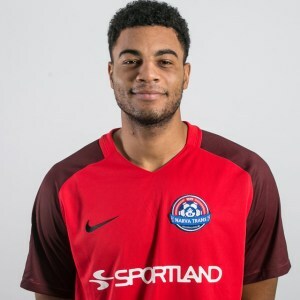 He has 15 caps and two goals with Bermuda and was recently appointed captain when quickly emerging as a leader for the side who are pushing for Gold Cup qualification. He started his career in English non-league before joining Harrisburg City Islanders in America and returned to play for Ilkeston under Shaun Goater. Leverock was a standout player for Narva Trans as they finished fourth in the top flight in Estonia. Leverock said after signing a one-year contract: “It’s an honor to sign for Sligo Rovers today. “I’d heard about the club from former player Ciaran Nugent who I know from the Islanders and Jake Keegan too who plays for St Pat’s. “I’ve done my research on Sligo Rovers and I see the community aspect of the club, that there’s a family within the club and that really attracted me to here. “It’s important to me to be part of a close-knit group and I see football is very popular in Sligo. “I’ve worked very hard to make it as a professional and I’ve just had a very good experience in Estonia. I think I did well and at international level it has been positive too. “When I spoke to Liam I really couldn’t pass up the chance to come play for him and this club. “He told me of how he wants Rovers to improve and I think he can help grow me as a player. “He explained there will be tough competition but that’s something I thrive on and it makes us all better players. Buckley said: “Dante emerged as a possible signing and we took a good look at him and thought he had something to offer. “He’s a good big center-half and while his goal record might stand out, he’s a defender so clean sheets is his target. “That’s useful as we have a lot of youth in our squad and we need a balance.